sets to dark, mind-bending stomp-a-thons. the dark and dirty to full-on funk and all points in between. and suspense that captures the mind and commands the body. In the chill area we will also be offering hookahs with flavoured shisha as well as having hot organic teas, kava and a light nosh as we break bread with family. 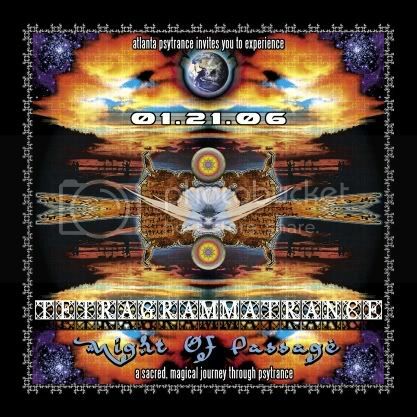 8 hours of home-brewed ATL psytrance!!! Last day for pre-sale ticket purchases will be January 18, 2006.
guaranteed to those who purchase a pre-sale ticket in advance! A limited number of tickets will be available for purchase at the door. of tickets available for purchase at the door. More details will be provided AFTER pre-sale ticket purchase.